My friend, Eric Frisbee, told me to "go climb a tree." At first, I was offended, but then a smile slid across his face and I saw he was serious. He pointed out how beautiful he had found a specific tree, telling me I, too, would smile when I observed it from up close. Eric is a video editor with an eye for beauty. He has a wonderful touch with putting moving pictures together on our daily newscasts. So when he told me about the tree I ought to climb, celebrating its beauty, I took his advice. The tree was the big willow on the northernmost edge of Cleveland Metroparks Edgewater Park. Eric was right. I had seen the tree many times, but usually from a distance. On his advice, I stood under the spreading branches of the willow tree. I thought of the old standard song, "Willow Weep For Me." There seemed to be a music in the tree, especially the way the wind sweeping across Lake Erie made the branches dance. The tree has long been an icon of Cleveland. 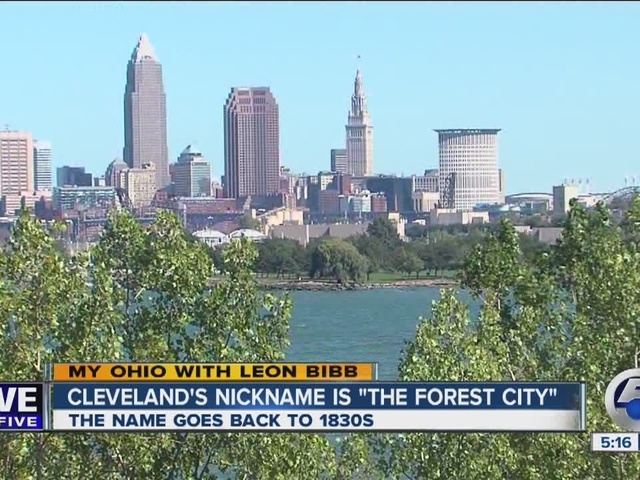 It fits well with Cleveland's nickname, "The Forest City," a term the city picked up in the 1830s when the community was just a dot on the map. Traveling French writer Alex de Tocqueville noted the abundant forests around the then-small community established on the shore of Lake Erie. The name stuck. Cleveland is filled with large stands of trees which almost encircle the community. The big willow is under the care of the Metroparks. But, if it did not care for the swaying willow, citizens of the city would do so. Constantly, there are visitors to the tree who sit beneath its branches, enjoying nature's offering. "It's a beautiful tree," Rachel Senese said as she read a book at the roots of the tree. "I always wanted one of these willows in my own home," she added. During the traditional lunch hour, many visitors bring food and sit under the tree or within sight of it. The tree seems to draw a strength from Lake Erie which is within 10 yards of its trunk. It is surprising with the heavy winter storms which are known to roll off the lake, the tree has weathered Mother Nature's icy fists. But it has. So Clevelanders celebrate the stamina of a tree which has stood for many generations. Photographers have snapped pictures of the tree in all kinds of weather. It seems to know it is an icon of Cleveland. The big willow seems to pose and give a smile to any camera. My friend, Eric Frisbee, was right. He loves the tree so much, he has photographs of it in his collection. Among them is one of Eric walking at the base of the tree. If you have not seen it, you ought to do so. It stands nearly alone just where the land ends and the water of Lake Erie begins. The Big Willow of Cleveland. Tall. Stately. Majestic.